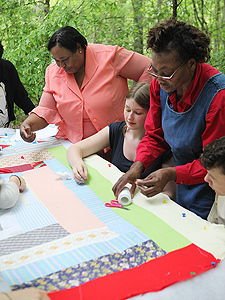 The Hilltop Montessori School has partnered with Guilford Sound and the Catherine Dianich Gallery to bring eleven residents from Gee's Bend, Alabama, to Brattleboro, Vermont, to display their renowned quilts, share their stories, and perform the play Gee's Bend. Hilltop Montessori's middle school has traveled to Gee's Bend, Alabama, and surrounding areas every other year since 2003, as part of its "Evolution of the American Identity" curriculum. The Civil Rights Movement is a significant portion of that study, and the odyssey to Alabama is an opportunity to explore and gain understanding of the significance of race in American history, culture, and society. Paul Dedell, Middle School Director, wanted to reciprocate the hospitality shown to students for so many years by inviting a group of quilters and Gee's Bend residents to Vermont. 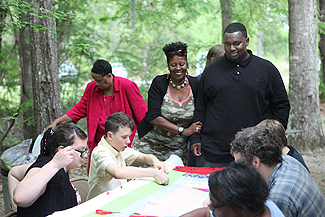 In 2006, the playwright Elyzabeth Gregory Wilder wrote Gee's Bend, based on the life of Mary Lee Bendolph, a matriarch of the Gee's Bend community, now a famous quilter, and a friend to Hilltop Montessori School. The play includes gospel music often sung by the women of Gee's Bend and tells the powerful story of a family as it experiences both personal and political events. The Rev. Clinton Pettway and several parishioners of Ye Shall Know the Truth Baptist Church have been producing and performing Gee's Bend at their church for several years. The profound beauty of this amateur performance is its direct connection to the community of Gee's Bend. These are not professional actors playing roles; they are relatives, friends, and people who continue to live the struggle of poverty and isolation in this rural community. Three performances of the play will be staged at Hilltop Montessori School during Gallery Walk weekend: Friday at 8:00 p.m. and Saturday at both 4:00 and 8:00 p.m.
As part of the ongoing events honoring the Gee's Bend quilters, Putney resident Vanessa Vadim will hold two screenings of her documentary film The Quilts of Gee's Bend, which accompanies a major exhibition of the same name. Set in the quilt-makers' homes and yards, and told through the women's voices, this music-filled, 28-minute film takes viewers inside the art and fascinating living history of this uniquely American community and art form. The award-winning filmmaker will be on hand to discuss Gee's Bend history, the quilt-making process, and the making of the documentary. The screenings will be at 6:30 and 7:00 p.m. during Gallery Walk on October 2. Funding for this project was provided by grants from the Thompson Trust, Brattleboro Savings & Loan, The Trust Company of Vermont, and Next Stage Arts, as well as donations from Hilltop supporters. Housing will be provided by Guilford Sound, and a number of quilts will be exhibited at the Catherine Dianich Gallery at 139 Main St. in Brattleboro. 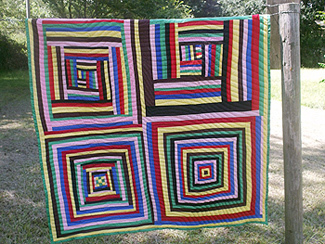 Visitors who stop in at 5:00 to 7:00 p.m. on October 2 will be able to meet some of the Gee's Bend quilters. Otherwise the gallery will be open on Fridays and Saturdays in October and November from 12:00 to 5:00 p.m., as well as by appointment—phone (802) 380-1607. 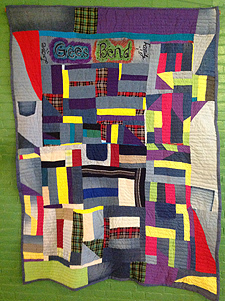 A few Gee's Bend quilts will also be on display in the lobby of Brattleboro Savings & Loan at 221 Main Street. For more information or to reserve tickets for the Gee's Bend play, visit www.hilltopmontessori.org/geesbend.